i'll see if i can get some pics for you .. Thank you! They look good. Was it just a litter of three? Do you know the names of the parents? I have been putting off the AGCA meeting, until Hamlik returns from Armenia - and he's back now. With a puppy :)a red male, good looking dog, lots of brain, levelheaded but hasn't been socialized yet. I hope to come to Little Armenia Monday or Tuesday, depending on weather and schedules. Thank you! and check the info next to Lucy's pic, and let me know what I should have written, ok? I don't have much info on parents, the guardian / keeper of the dogs is in Armenia at this time, wan i see him next time i''ll ask. of dog had had appeared yet in the IV century and it was used in army." was bred by local people usingprimitive selection. and exclusive friendliness to humans. (26 in) or more, and in female dogs is 62 centimetres (24 in) or more. from 45 to 60 kilograms (99 to 130 lb). according to the breed standard. to preserve the phenotype and working traits of Gampr dogs. such as the CAO, and in the Red Star Kennel in the USSR. that cluster only with the dogs of Spain and Scandinavia. a Sharplaninatz, or a cross of these. գամփռ - գամ փռ - գամ-գալ- փռ-Փռել գամ-փռեմ գալ-փռել ??? The Armenian wolfhound Gampr was recognized by the International Kennel Union (IKU) on February 10, 2011 thanks to the efforts of Violetta Yurievna Gabrielyan, the president of the Kennel Union of Armenia and the initiator of the process of recognition of the breed at International level. To make the approval of the breed possible, Armenian cynologists have prepared documents proving the origin of the breed and providing reasoning behind the need to recognize it as Armenian. The initiative became a necessity after the Turks presented the Gampr breed as Anatolian Rapabash at numerous international dog shows. 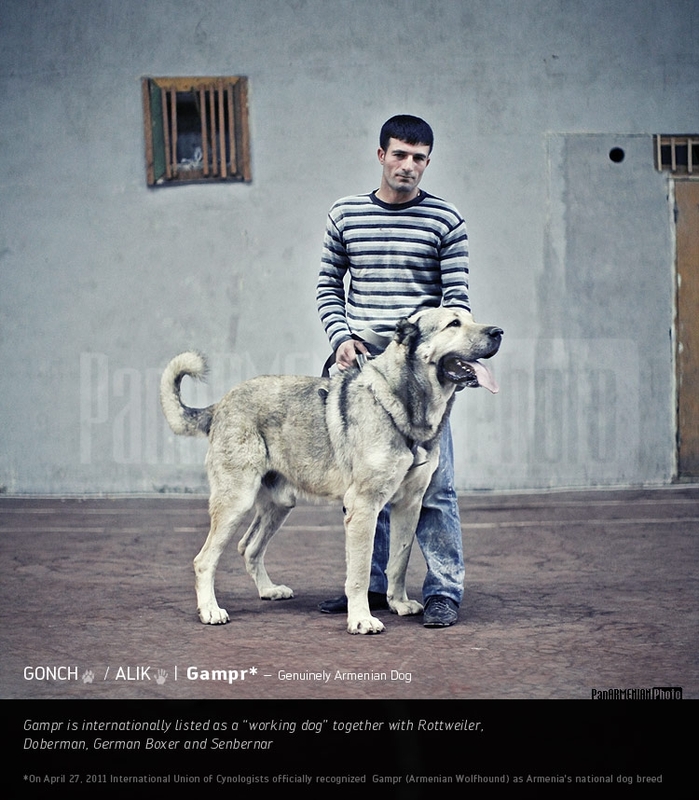 Gamprs have always been one of the most famous animal species from Armenia. According to Armenian scientists, Gamprs are mentioned even in ancient Roman sources. A similar situation has also occurred several years ago. Turkey presented the Armenian mouflon as Anatolian mouflon and tried to make scientific circles to rename the breed. The next mission of the organization is to fight against the false designation of Van cats, which are now known as Turkish Van cats. Today, Van cats live in the area of Lake Van in the territory of modern Turkey. It is a common pet among those who have been former residents of Turkey. In Armenia, 40 Van cats are registered today. Thanks for posting here, it brought this thread forward into the light.